Young Living has been producing essential oils from their farmlands in Utah and Idaho since 1994. They have developed their own process for distilling essential oils, which they call seed to seal. Since inception, Young Living has expanded internationally and now has offices and farms all over the world. Over the years, more than 2 million people have signed up to become members of the Young Living network marketing system. At the Finance Guy, we believe that you can't make money with network marketing, but we decided to do a full review of Young Living. We want to find out if this really is an original money making opportunity, or if it's just another MLM. There is no doubt that Young Living is making money. In 2016, they generated $1.0 Billion in sales which earned them the No. 22 spot on the 2017 DSA Top 100 list. However we're not interested in how much profit the company is making. We want to know if it's possible for you to make money from joining the Young Living Income Opportunity. At The Finance Guy, we believe that retail sales are an essential part of any business. After all, selling to customers is how companies generate profit. Without retail sales, there is no profit. It's a little concerning that Young Living does not think that this essential part of the sales process is worthy for inclusion in their compensation plan. As a relatively new member to Young Living, you might also qualify for the 'Rising Star Team Bonus'. Young living will devote 1% of their commissionable sales each month to paying this bonus. To be eligible, you must be either a 'Senior Star', or an 'Executive Star', and build at least 3 legs. In other words, you have to recruit.. As you keep recruiting you and building legs, you can climb the Young Living ranks. This raises Red Flag 2 - Promotion Through Recruitment. Our concern with these commissions is that they're based on the 'wholesale prices' paid by members. This means that if you join the Young Living business opportunity, then every time you order Young Living products, 26% of your 'wholesale price', is going to your upline as unilevel commissions. This is common to the MLMs, and it is why their ‘wholesale’, prices are often higher than the store prices of similar competitor products. If you are lucky enough to recruit enough members to generate 10,000 worth of Organizational Group Volume (OGV), then you might qualfiy for this bonus. While PV is generated by money you spend with Young Living, OGV comes from money spent by those you recruit. In other words, if you share the opportunity and convince others to become Young Living Members, then you can earn a commission from their Personal Volume spending. This also means that the people above you in your organization earn money from your spending. Along with the generation commission, once you have reached the rank of Silver, you could qualify for a Generation Leadership Bonus. Young Living sets aside 6.25% of their commissionable sales each month to pay this bonus to the upper ranks of their members. If you keep recruiting new members and generating OGV, you might reach the rank of Diamond. 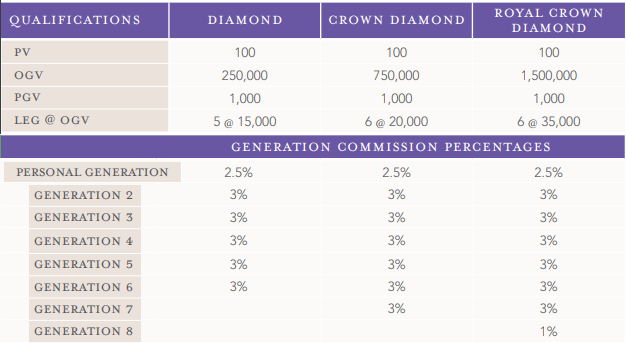 At this time you may qualify for the extra 0.5% of commissionable sales paid as the Diamond Leadership Bonus. This is on top of the 26% which goes toward Unilevel payments. If you become a new member, then a total of 54.25% of what you spend on Young Living is paid to your upline. This raises Red Flag 4 - Most of the Rewards go to your upline. This price loading is why MLM products are generally more expensive than those sold through regular stores. The commissions for their compensation plans are included in the prices they charge to members. As we can see from the image, the focus of the Young Living opportunity it recruitment. If you just find 5 friends, then they do the same, it goes into auto pilot. By the time you get to generation 5, there are so many people in your downline, that drawing waves is better than making circles for each of them. The first thing we notice is that 94% of all active members are at the 'Distributor' rank. This means that only 6% or 1 out of 16 members achieves any promotions at all in the Young Living business opportunity. We believe that the network marketing business model makes it hard for anyone to succeed in Young Living. MLM isn't designed to help people make money or gain financial freedom. It's a system designed to promote and sell products. MLM is profitable for Young Living, who are making money from selling products to members, but not for the members who join the business opportunity. If you want to earn part of the 54.5% which Young Living pays as commissions, then you need to build a large team. The only way to do this is to recruit new members and have them do the same. In theory, it's as simple as sharing Young Living with a few friends. In reality building your MLM downline with Young Living will take substantial time and effort. If you decide to become a new member of Young Living, then recruiting new members will be essential to your success. After all, if you can't build a downline, then you'll end up in the 94% who never earn more than 13% commissions. If you want to tap into the full 54.25% offered by the Young Living compensation plan, then you need to be very good at recruiting new members. Even if you are good at finding new recruits to sign up for the Young Living Income Opportunity, you might still struggle to build a downline. This is because network marketing companies struggle to keep members in their MLM systems. We also read that '57% of all members who joined in 2014 had quit by 2016'. This is probably because once they stop buying product, they don't renew for another year either. If you join the opportunity, then you should expect at least half your Young Living downline to quit every year. It's important to remember that success in any MLM requires you to make a lot of sales. If you join the Young Living opportunity, then you'll be selling their products. Any salesperson will tell you that the best way to make money, is with good products. This review certainly puts Young Living in a positive light. It could be because the products are really good, or it could be because it was written by a Young Living member trying to sell us essential oils. In our search for a more balanced review, we found a collection of FDA warnings to Young Living. Mostly the FDA is concerned with how Young Living products are being promoted to consumers. Reviews, such as the one we looked at above, claim that essential oils have a wide range of benefits. According to the FDA, these claims would qualify the oils to be drugs, however there are no FDA-approved applications for these products. No doubt Young Living would make the standard MLM claim, that 'this is just a few rogue members'. However there are problems with the products themselves. The FDA notes that Young Living essential oils are not generally recognized as safe and effective for use under the conditions prescribed, recommended, or suggested in the labeling. are not generally recognized as safe and effective for use under the conditions prescribed, recommended, or suggested in the labeling. We also looked at Live Science, who acknowledged that essential oils are used in some alternate forms of medicine. They then explain that there is limited scientific evidence that they provide any real benefit. So it would appear that the problem is not just with Young Living, it is with all essential oils. While they may create nice smells, that is where the benefits end. Even though MLMs resemble illegal pyramid schemes, they are legal as long as there is a product or service attached to them. We don't think that Young Living members are trying to scam you. It's more likely that they themselves believe that the products work, and the opportunity will one day make them wealthy. Young Living is like any other company, they are in business to make profit. As we noted earlier, they appear to be doing quite well and are one of the most profitable MLM companies in the world. If you took a sales role with a top 100 company, you'd expect to make money. Yet if you become a Young Living member, then your chances of building a downline are less than 1 in 20. If your goal is to make money with Young Living, then we think you should probably examine all your options before making a decision. Before you join you should probably try using the products yourself for awhile. Before you try to make money convincing others to spend $100 per month on essential oils, you should do it yourself. Try the oils before there's any financial incentive. If you feel any real benefits which you think you can share, then you might be able to make money with Young Living. As with most network marketing companies, it is possible to make money with Young Living, but it is very unlikely. Imagine if you were offered a sales job at a company where more than half the sales force quits every year, and most sales people are losing money. Would you accept the job?